First you have to create and post a job ad, or maybe you’re out recruiting face-to-face. Next you have to filter through the candidates and schedule what seems like an endless number of interviews. Even if the candidates aren’t great, you still feel pressured to choose someone because you need to fill the position. Then you begin the training process, which involves orientation, menu tests, shadowing, reverse shadowing — all of which can take weeks. There is so much involved in the hiring process, and it’s demoralizing to think that you’re investing all of this time and money in an individual who statistically won’t even last a year. And, of course, once you lose an employee, you have to invest time and money into the hiring process all over again. 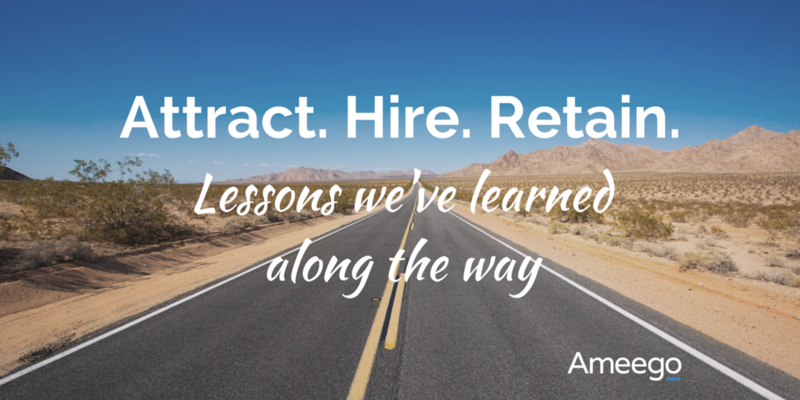 Ameego has taken its share of missteps when it comes to hiring, especially in our early days. As with any company, hiring missteps have cost us a significant amount in terms of money and productivity lost. Because the value we drive is tied directly to the amazing people we hire for our team, we continue to spend a ton of time and energy on developing the absolute best hiring practices. I want to share some of our most effective strategies for attracting and retaining the best employees, so that you can avoid the costly mistakes we have made in the past. At Ameego, we divide our hiring into two categories: 49 percent based on “skill set,” and 51 percent on "culture set.” “Skill set” refers to the abilities or skill-enhancing education that an individual possesses – things like multi-tasking or wine knowledge. “Culture set” refers to the core values that drive a person’s overall behavior and demeanor. Our reason for hiring based on these two categories is simple: a prospective employee can have all the skill in the world, but if they live by a “glass is half empty” approach that drags down our team, they'll end up doing more harm than good. On the other hand, a person can be the world’s greatest optimist, but if their inability to multitask causes the client (or guest) experience to suffer, they can't play on the team either. The perfect employee is one who has a great skill set – or willingness and ability to learn – and also possesses the right culture set. We hire based on culture first because we value a culture fit more than a skill set fit, and I’ll explain why. In business there are two types of events: “predictable” and “unpredictable.” As a business owner, you need to ensure that your workforce is capable of delivering an experience consistent with your brand’s standards. To prepare your employees to handle predictable events, you build processes, training material and concrete measurables to ensure your employees are achieving. However, business is also riddled with unpredictable events — a rowdy customer, a condescending remark in a meeting, etc. It’s far more difficult to train employees on how to handle themselves in unpredictable situations, because the nature of how they unfold can be so different. What takes over in an unfamiliar situation when you haven’t been trained to handle it? A person’s values take over. Those values are based on the lessons they learned growing up, and those that guide them through life. So, since you can’t train your employees for unpredictable situations, how can you ensure they would behave appropriately when they encounter such a situation? You hire a person based on how well their values match your company’s values — you hire a cultural fit. Values are very difficult to teach, which is why it’s so important to find people that already possess them. So here's what we do to ensure we get the best of both worlds. The first step is obvious, and hopefully it’s something you’re already doing: make sure you’re really clear on the skill set required for the given position. The second step is to create a list of values that a person must possess in order to be hired. If you don't already have those values sorted out, I'd suggest you read Setting the Table by Danny Meyer. Meyer is an incredibly successful restauranteur, and incorporates a concept he calls the “hospitality quotient” to measure the values he looks for in his employees. I’d highly recommend this book for anyone who wants to take their restaurant to the next level. At Ameego, we spent roughly a year creating the core values that define our culture. In addition to what we learned from Meyer’s book, we discovered a ton of value from sources like Tony Hsieh (CEO of Zappos), Vishen Lakhiani (CEO of Mindvalley) and Simon Sinek. Now that you’ve defined your skill and culture sets, you need to re-write your job ad and interview questions so that they speak directly to the values you’re looking for in an employee. This step sounds intuitive, but is rarely incorporated into a company’s hiring process. Remember, your goal is to attract the best talent, which means you want to find those people who are a skill set fit and a culture fit. By writing a job ad that speaks to the values you’re looking for in a person, you preemptively weed out those personalities who don’t fit the bill. Yes, you might get fewer applicants, but that’s fine. You’ll reduce the amount of time it takes to sift through applications and interview those people that you didn’t want to apply anyway. You want to attract only those people who fit your ideal employee. This means fewer applicants and fewer interviews – but improved results. Think of it as doing less, but better. 3. Be humble too. Yup, we understand. Being really awesome and humble at the same time isn't easy. Obviously being “awesome” isn’t a skill. This might look silly because you don’t see this type of thing in the average job ad, but we’re not looking to hire someone who’s just average. “Be average” didn’t make its way into our set of core values ;). We incorporate culture-based questions into our interview process as well, and here’s why. In addition to ego and empathy, we think sense of humor is a huge component of a great culture. We hold a weekly awesomeness meeting in which we summarize only great things that happened in the week. And it’s everyone’s favorite meeting – often my cheeks are sore from laughing so much. It’s imperative that we find people who love to laugh, because we believe happiness is productivity. The awesomeness meeting would get pretty dull pretty quickly if we didn’t find people who love to laugh as much as we do. It sounds like a harmless question, but the answers are amazing. We’ve heard things like “I once trained for a year to become a WWE wrestler” or “I had vampire teeth surgically implanted for a year.” As you can imagine, the ensuing conversations were pretty interesting – which is exactly what you want. You want to hold a conversation that gives insight into the kind of person they are and what makes them tick. The trick is to find people who value the same things you do. That creates loyalty. The more loyal your workforce, the lower your employee turnover. By incorporating these steps into your hiring process, you'll attract far better applicants, drive down the time you spend hiring, and pick those people who are more likely to be loyal to you and your brand. Hire based on culture above all else, and you'll be happier for it – and so will your pocketbook.